Mike Bonner is just plain crazy on stage. Mike stood out on his first season of "Bad Boys of Comedy" with his authentic routine. 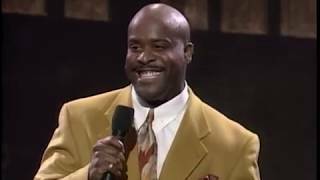 Mike Bonner has also appeared on Russell Simmons HBO's "Def Comedy Jam", Jamie Foxx's "LaffaPalooza", and seven seasons of BET's "Comic View" where he won his own Grandstand Comedy Special. A 14-year veteran of the Stand-Up Comedy Scene, Bonner was one of 10 comedians selected in 1999 to appear at the prestigious, HBO sponsored US "Comedy Arts Festival" in Aspen, CO. After a near fatal car accident in early 2001 almost took his life, five months later he went on to win the "Bay Area Black Comedy Competition". A 36-year old native of Detroit, Bonner's act focuses on family life about his wife and three kids. You will relate and you will laugh til you hurt!